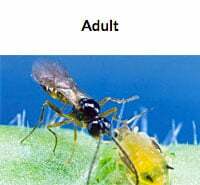 These tiny, parasitic wasps lay their eggs inside aphids causing them to mummify and die. Each 250cc shaker bottle will treat 3600 - 7200 square feet, depending on pest levels. Effective biological control for aphids! 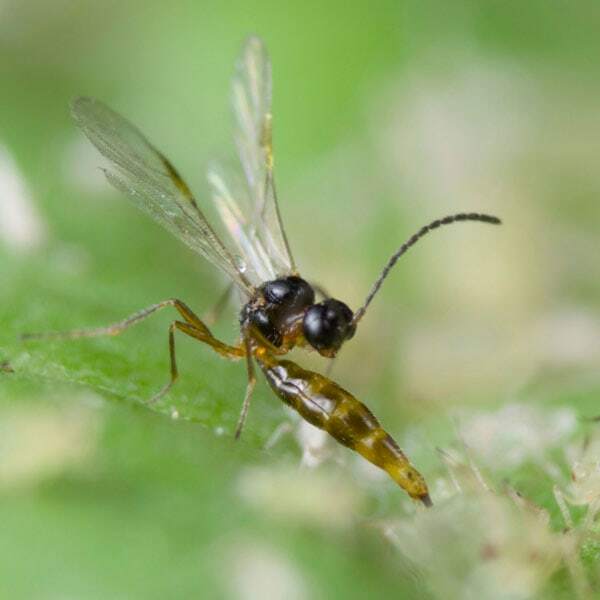 This tiny parasitic wasp (Aphidius colemani ) hones in on its prey by sensing the distress signals of infested plants as well as detecting the aphid’s honeydew secretions. Once there, it injects an egg into the aphid. When the egg hatches, the larvae begin to consume the pest from inside. The resulting wasp then emerges from the rear of the dead aphid to seek out other prey. 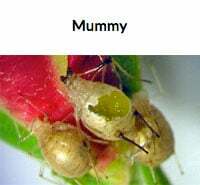 Surviving aphids react by emitting an “alarm” pheromone which causes the colony to flee, often falling to the ground where they die. 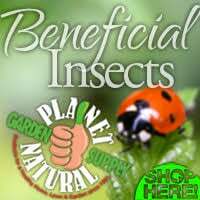 Shop our large selection of beneficial insects, including aphid parasites, at Planet Natural. One bottle — 1,000 parasitic wasps — treats up to 7,000 square feet and costs $94.95 with UPS Express shipping included! Appropriate for garden and greenhouse use, aphid parasites can be used both as a preventive measure and to combat infestations. 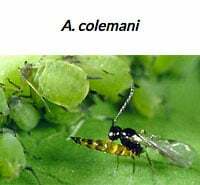 Adult wasps live two to three weeks and will lay eggs in as many as 300 aphids over the period of their lives, increasing the numbers of wasps as they do. Proof they’re at work can be found by searching for the brown, mummified shells left of dead aphids. Spread the material evenly over soil or rockwool slabs. Efficacy is reduced at high temperatures, greater than 80˚F. Repeat weekly for 2-3 weeks, as needed. Note: You will begin seeing “mummies” in the crop 10-14 days after the first application.